I first wanted to wish a holiday holiday to all of you Chocolate Shavings readers. Your kind comments, emails and readership mean the world to me and make me want to write even after a long day. I hope your holidays are filled with great company, delicious food and a lot of love. Maybe even a few thoughtful gifts too! 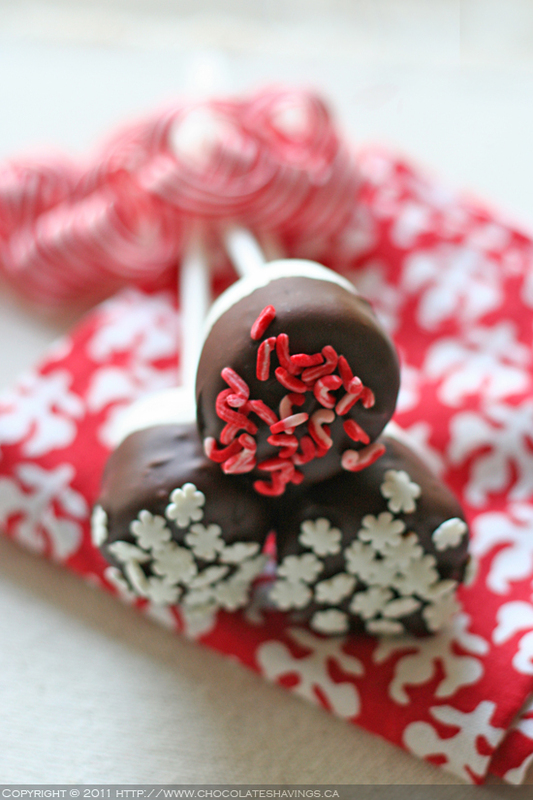 For a simple festive treat, here is my recipe for marshmallow pops. These are delicious - and even better with homemade marshmallows!. You can make them as a part of a dessert buffet table or a simple indulgence for an afternoon party. Once the chocolate has set you can lay them out on platters or creatively display them upwards on a table. If you like marshmallows as much as I do, these are the treat for you! Using a double boiler, melt the chocolate until smooth. Place a marshmallow at the top of each lollipop stick. Dip in the melted chocolate tapping off excess. Add sprinkles and leave to cool. These marshmallow pops are so adorable! How adorable are these mini candy cane and snowflake decorations! Perfect for your marshmallow pops. such a simple idea and so pretty! jas - the gluten free scallywag: Thanks - it's definitely an easy treat to put together! This is a great recipe for parties of all sorts, and so versatile. Came by to oggle your gorgeous sweets! Hope you're having Happy Holidays! Best wishes for a fabulous New Year! Cakebrain: Thank you - wishing you a fabulously sweet year to come! What a cute and simple treat! Happy 2012 to you, Jennifer! Cooking Rookie: Thanks, to you too! How cute and adorable! And not to mention delicious :) I can totally see these being devoured at a party...especially with little kids. Great idea and gorgeous photo!